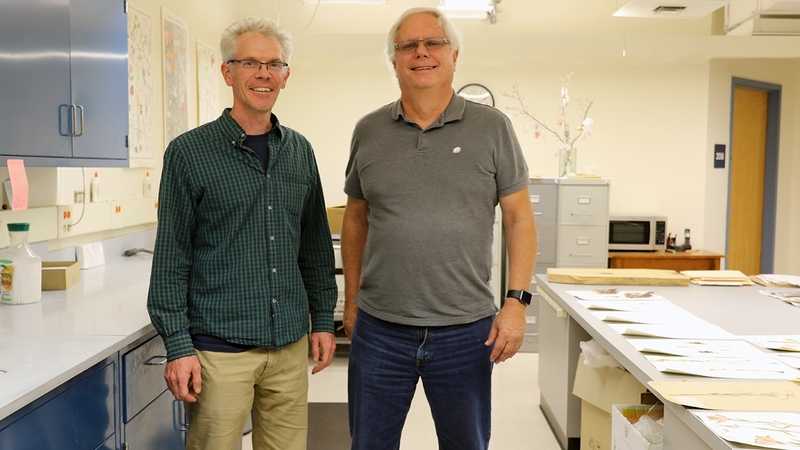 (l. to r.) Phil Tonne, manager, and Tim Lowrey, curator of the UNM Herbarium. Wood lily specimen, El Porvenir, collected by Brother Arséne, 7/8/1927. Lauren Bansbach, a graduate student in biology, placing a specimen in the imaging box. Fireweed specimen, Big Costilla Peak, collected by Ben Legler, 7/21/2007. Cabinets housing the plant collections at the UNM Herbarium. Hidden among the shelves and cabinets of natural history collections lie thousands of preserved plant specimens that represent the diverse flora of our planet. 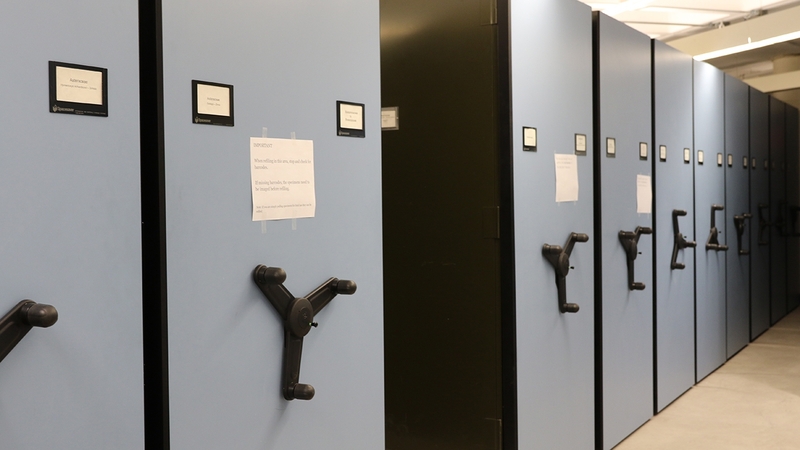 Scientists and researchers physically access these collections around the world in order to address challenges that threaten humanity and our environment. 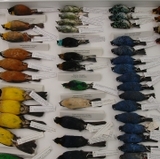 These specimens are rich sources of information about our planet's biodiversity and history. 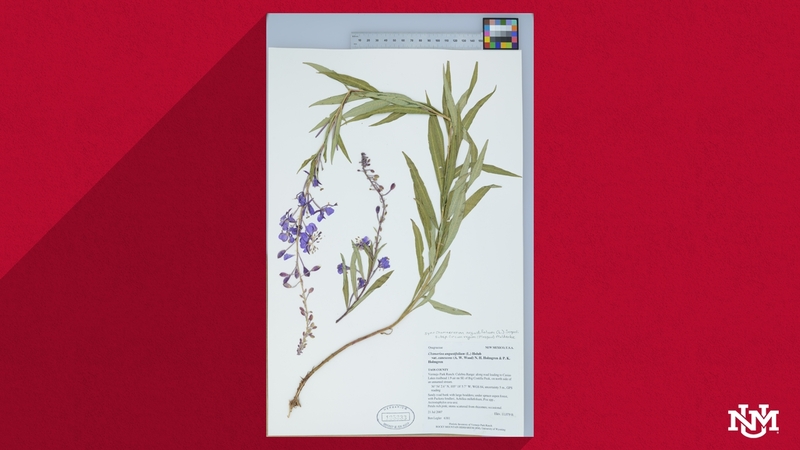 Their usefulness is limited because the number of people who can visit is limited; by providing digital access to the collections, The University of New Mexico’s Herbarium is opening its doors to the global community. 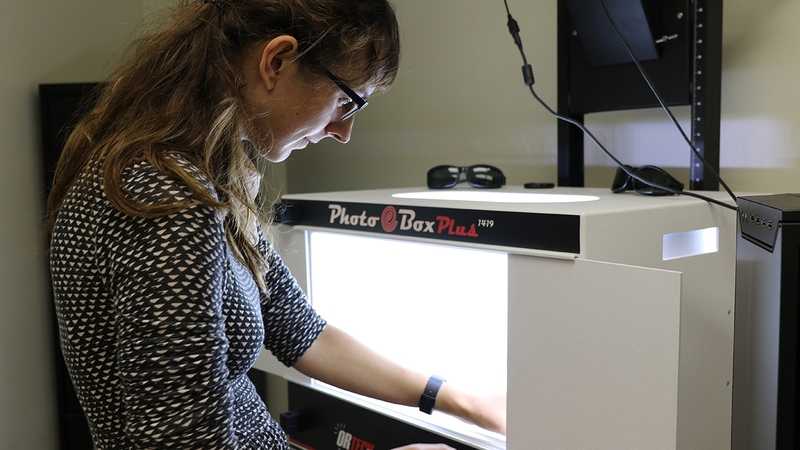 The UNM Herbarium, a division of the Museum of Southwestern Biology, is bringing digital life to the thousands of plant specimens within the herbarium. The herbarium houses well over 135,000 plant specimens, representing 10,300 taxa, making it New Mexico's largest collection of plants from the Southwest region. 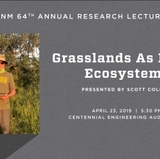 "As our collection continues to grow, we are met with the challenges of maintaining quality records and providing access to experts in need of this information, " said Timothy Lowrey, associate dean of Graduate Studies, professor of biology and curator of the UNM Herbarium. 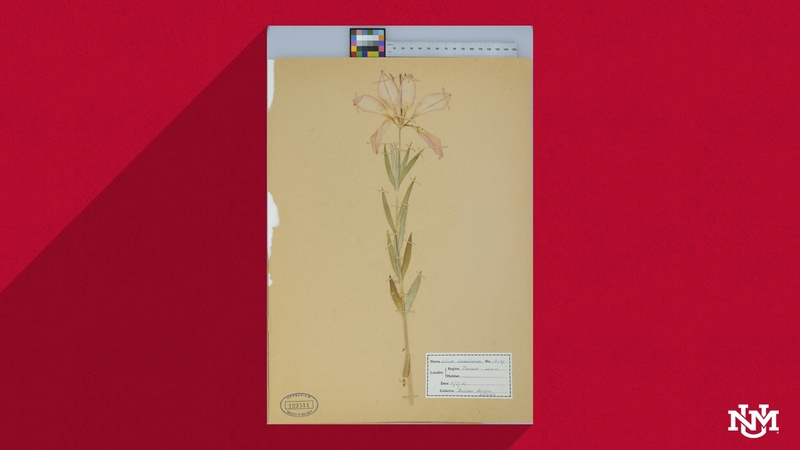 Since 2002, the UNM Herbarium has worked to digitally document the collection by adding names and description of plants to public online biodiversity databases, such as SEINet and iDigBio. As technology advances, so does the need for these databases to include even more detailed data, including visual imagery and precise locality mapping. 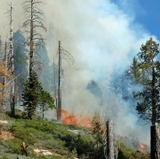 Over the next four years and with $190,000 in support from the National Science Foundation (NSF), Timothy Lowrey, principal investigator of the project and Phil Tonne, manager of the UNM Herbarium, will steer the “Digitization Thematic Collections Network: Collaborative Research: Using Herbarium Data To Document Plant Niches In The High Peaks And High Plains Of The Southern Rockies: Past, Present, and Future” project to enhance the digital preservation effort, by including visual imagery and precise locality mapping data. Lowrey notes, "in the midst of global environmental change, this is a timely opportunity to expand accessibility and utility of our incredible and diverse plant collections." UNM joins 37 partner institutions under this grant in an international effort to make biodiversity data electronically available to the public. The data from this project represent two million herbarium specimens that can be used to document and describe habitats - past, present, and future - in this ecologically important region. The current project focuses on collecting enhanced specimen data - which include high resolution photographs and precise locality mapping - and contributing these data to the existing online biodiversity databases. 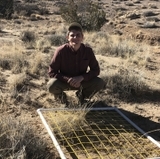 The project also provides a unique opportunity for students to develop a mapping system to locate specimens using the location information. "As botanical experts access our collections, their feedback allows us to refine our understanding of the world we live in and adds to the value of this extensive resource," said Tonne. 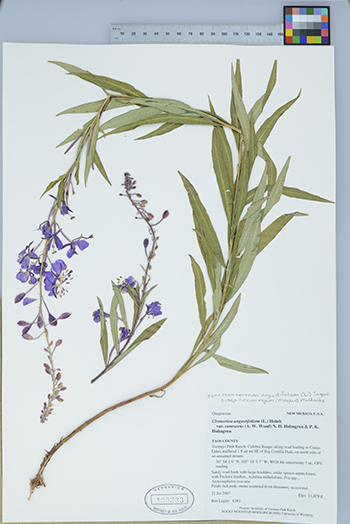 "The herbarium is a trove of knowledge about the flora of our region, and the digitization of the specimens under this grant will make it more accessible to researchers and students from this point forward," said Christopher Witt, Director of the MSB. "I’m also very excited about this project because it will get more students involved with our natural history collections at MSB and I’m sure that some of them will become inspired to pursue biodiversity research."